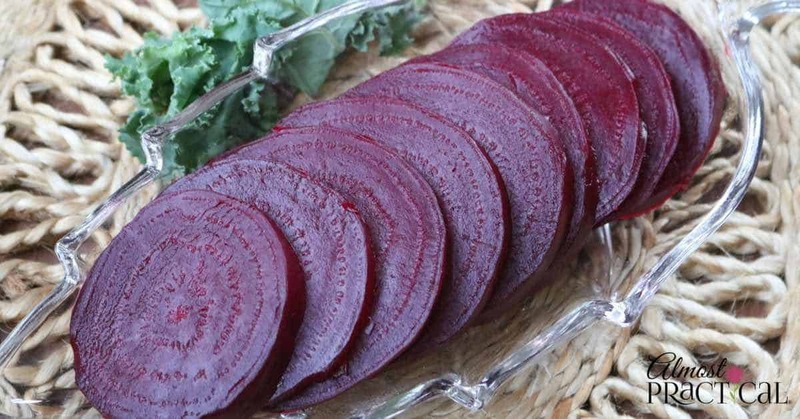 Most of us don't know how to cook beets, even though they are one of nature's more perfect foods. Luckily they are pretty easy to make and cooked beets store well in the refrigerator. This means that you can make them ahead of time and add them to your recipes as you need them. Because beets can take a long time to cook, I make them in my pressure cooker to speed up the process. But you can make them on the stove top, just be aware that they will take longer to cook. The first step is to cut the greens off of the beets. Make sure you do this as soon as you buy them because they wilt quickly. The beet greens are edible, so you can chop them up and add them to soups, stews, and other recipes. However, note that beet greens have a higher sugar content than a spinach or kale – so your recipe will taste sweeter. If you are not going to cook the beets right away, I would leave about an inch or so of the stem on the top and leave the root end intact. When you are ready to cook the beets, cut off the stem end and cut the root off as well. 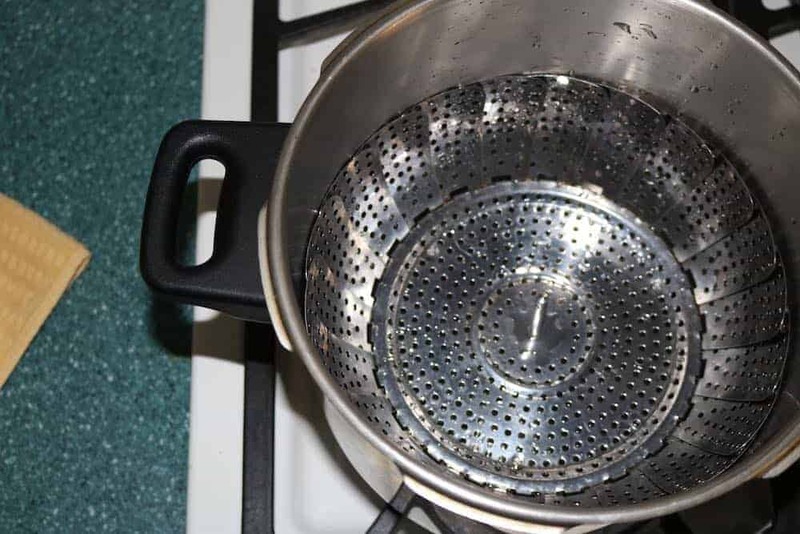 Place a vegetable steamer basket inside your pressure cooker and fill with water to just beneath the steamer bottom. I use a metal vegetable steamer and am not sure if a plastic one will work for this purpose. Place the trimmed, uncooked beets in the steamer basket. Close the pressure cooker and cook on high heat until pressure is achieved. Then reduce heat to low and make sure that the pressure is maintained. Cook for 20 minutes and then turn off the stove. Let the pressure drop naturally. Once all of the pressure is released, open the pressure cooker and poke the beets with fork to make sure they are tender. At this point the beet skins should slide right off with the push of a finger. Remove the peels, slice and serve. 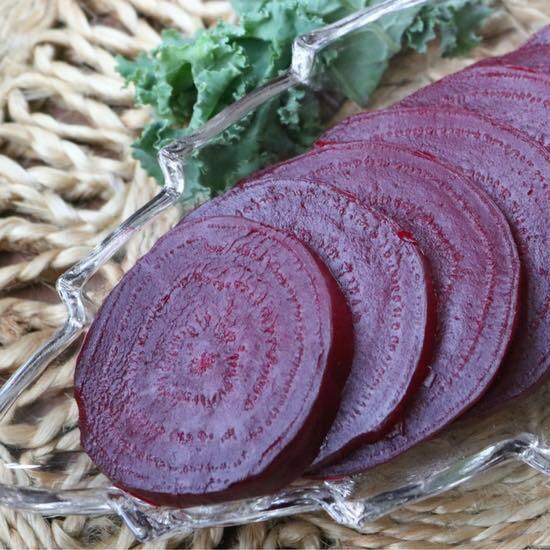 If I am not going to use the beets right away, I cover the slices with a little water to keep them moist and store them in an airtight container in the refrigerator. If you don't have a pressure cooker, that's ok too. 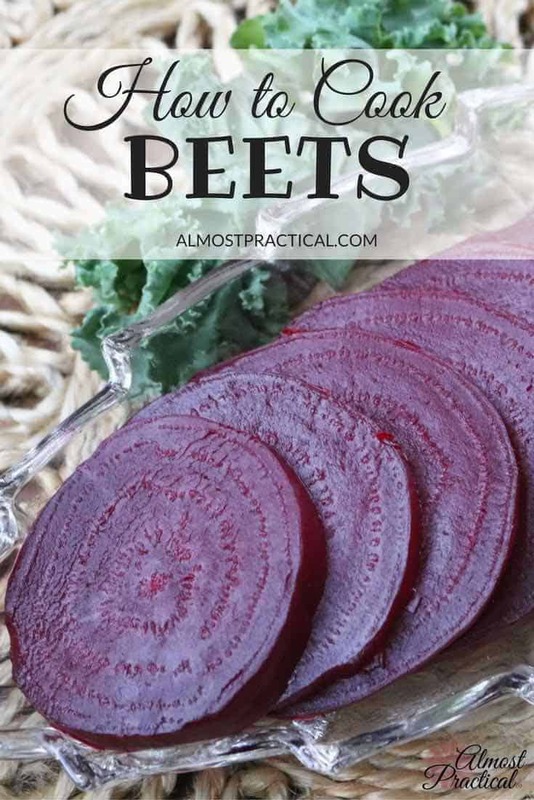 Place your beets in a steamer basket in a regular pot, fill to the bottom of the steamer with water, and cook on the stovetop until the beets are fork tender. While the beets are cooking, check several times to make sure the water doesn't run out and add more water as necessary. Depending on the size of the beets, they will probably take about 45 minutes or so to cook completely. To speed up the process you could cut them into quarters first and then steam. Also, you can easily modify this recipe for the Instant Pot , too. You can see my Instant Pot Beets Recipe here. One of the things I that I have been working on is my food photography. I have been immersed in the Food Blogger Pro course (click here to learn more about it) and my pictures have improved immensely. I even had my very first food photo published on foodgawker. 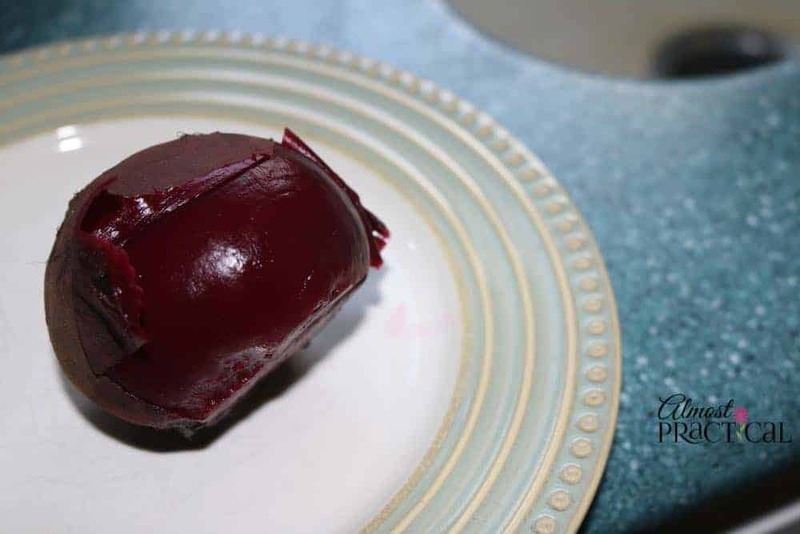 Cooked beets in the pressure cooker are quick and easy to make. Wash beets and trim leaves, stems and roots. Place steamer basket in a 6 or 8 quart pressure cooker. Fill pressure cooker with about 2 inches of water - just below the bottom of the steamer basket. 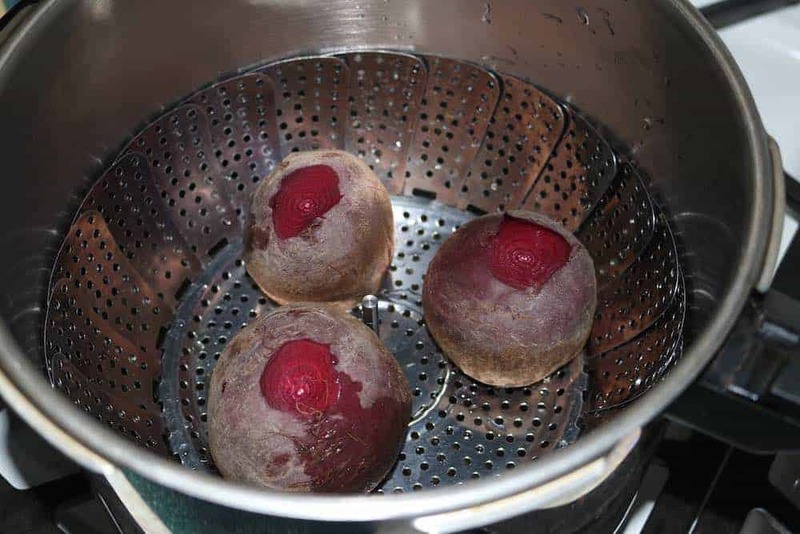 Place beets in steamer basket and close pressure cooker. Bring cooker to pressure over high heat, and then reduce heat to low. Make sure that pressure is maintained. Cook in pressure cooker over low heat for about 20 minutes. Turn o stove and let pressure reduce naturally. When pressure is gone and pressure cooker is safe to open, open the pressure cooker and test doneness of beets with a fork. They should be tender. Slide peels o of beets and slice. Store cooked, sliced beets in a little water in an airtight container.